Zachary Pfaff (the guy on the left!) has been in the bike business since 1998, and has been passionate about bikes his entire life. His journey began in New Hampshire (where he’s from) at Goodale’s Bike Shop. They took a chance on a 14 year old and he continued to work there until he graduated from high school. His passion for cycling stayed with him when he moved to Tulsa to attend Spartan College. He continued to work locally in the bike industry while in Tulsa. 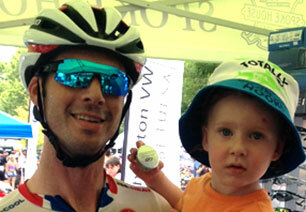 During this period, he met his wonderful wife Brittany Pfaff who also has a love for cycling. He liked Tulsa so much, he decided to stay! After a plane crash in 2010, Zach decided to change his career path and began planning his bike shop. Everything came together in March of 2012 and the first shop location was started on Lewis Ave in Tulsa, where it began to thrive. A year later, they expanded their business into Broken Arrow, as well. Soon after, they decided It was time to find a better geographical spot for the Tulsa store, in which they found the 21st and Boston building. Zach enjoys commuting to and from work and racing on the weekends, with his little boy Bennett standing by to cheer him on. Shop Dometique. Oldest and not necessarily the wisest.